Conservatories from Dream Installations offer end users a wide array of roof options, with glass, tiled, and polycarbonate to choose from. All help to ensure that the extended living space stays as comfortable as possible throughout the year, yet each present their own perks and advantages such as improved heat retention, self-cleaning, and reduced glare. Depending on what you hold in high regard will likely inform your designated roof option. Most of our available roof options are sourced from reputable systems companies and industry heavyweights Pilkington Glass and Planitherm. Not only does this help customers of both a commercial and domestic nature believe in the conservatories we produce, but means they get to enjoy and experience the best light transmission, solar heat rejection, and U values possible. Activ Sunshade is the standard amongst our range in terms of glass, while the highly retentive 4S option is the premium choice. The sections below explore each option in more minute detail for those who wish to explore it, covering the configurations possible should you wish your conservatory to be fitted with a pure glass or more traditional polycarbonate roof. Whereas 4S glass implements effective temperature balancing using solar heat reflection, polycarbonate roofs shouldn’t be discounted, utilising foiled inserts to achieve the same result. Homeowners have two choices with regards to the panes used within their conservatory’s glass roof: Sunshade and Planitherm 4S glazing. The first of which acts as the primary option that comes as standard, integrating various self-cleaning features to substantially reduce the levels of maintenance needed. With this option allowing the panes stay cleaner for longer even in rainy conditions. Sunshade glass’ sheeting effect still allows for clear outside views in the event of harsh rainfall, with UV rays from the sun breaking down any grime or dirt left on the surface. Upgrade to a Planitherm 4S glass roof and your extended living space will have a far easier time at balancing temperature levels, reflecting unwanted outside heat while still preventing the appreciated warmth that’s inside from escaping. In a double glazed capacity, Planitherm 4S offer U-values as low as 1.0W/m2K, resulting in some of the best energy efficiency levels around. As well as roofs, Planitherm 4S is also a favourite for use within the windows and doors of south-facing conservatories, providing the ultimate heat reflection defence against the sun’s rays. Glass roof thicknesses can be adjusted on a property-by-property basis, acting as an acoustic defence layer between conservatories and the hustle and bustle the outside brings. Heat is also successfully reflected with every glass conservatory roof, and glare can be reduced by up to 57%. Protective measures such as these ensure that every conservatory can always be used to its fullest potential. Polycarbonate roofs can be supplied in a choice of either 25mm or 35mm depths for greater flexibility, with tint shades of either Opal and Bronze as well as the traditional Clear. Glass roofing can equally be configured, integrating a choice of either ‘Activ’ or ‘4S’ glazing types, both of which work expertly to reduce heat intake and offer improved temperature balancing. To help your new conservatory stay comfortable 365 days a year, foiled inserts can be integrated into roofs as an optional upgrade. This allows heat to better operate at a balanced temperature, preventing the extended living space from uncomfortably warming up, reduces costs, all while remaining environmentally-friendly. 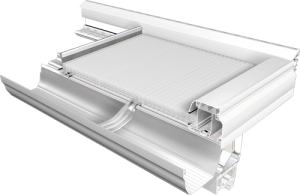 Once inserted, the polycarbonate foiled inserts will substantially reduce the likelihood of the space feeling too cold in the Winter and too Hot in the Summer. Even without the addition of foiled inserts, ISO 9001 quality performance accreditation is guaranteed as standard across all roof glazing, with every unit tested for durability, strength, and weather-resistance. The table below gives a simple comparison between standard double glazing, polycarbonate, and high performance Pilkington Activ conservatory options.